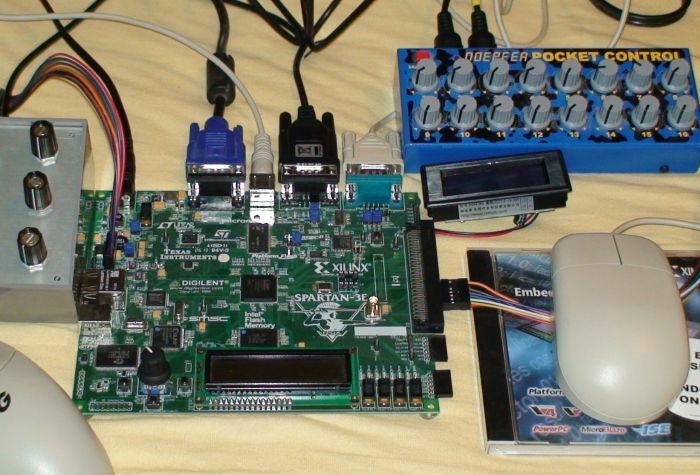 A Spartan 3E FPGA board is used to build a remake of my PLD-ORGAN project. Here, all components are made the digital way meaning, that they are virtually modeled. The main PLD component is basically the same as in the version of 2003 - only the analog components like the wave generator and the filters are replaced. Also the keyboard is virtually modeled and has been replaced by a simplified MIDI-box being capable to play up to 65535 music notes sequentially. The Music Engine produces MIDI-like tone information, based on pre defined tone information which is kept in a local memory in the FPGA. The notes are initially copied to the RAM during synthesis process of the FPGA. 127 MIDI notes are available, where 72 keys (6 octaves) are used. The data entry is done with the classical piano roll method using an Microsoft Excel sheet which automatically generates the code for the FPGA music player. Music entry is easy this way because for an organ, there is only on off required. The length of the lines = the cells covered indicate the time which the sound has to be applied. A second sheet analyzes the lines and eventually creates on off tags from it which are text-summarized in the last column finally. The code in the final column is used as a so called COE-file and will be loaded into the Block-RAM of the Xilinx FPGA during the compilation process. The data format is TTTT.NN.II "point of time", "note number", "intensity" where 0 means "off". 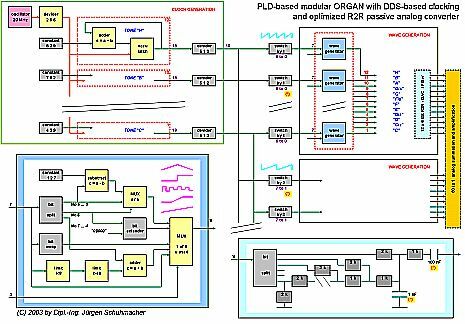 The sound synthesizer takes the music notes and produces audio signals for each midi channel using the virtual wave module and synthesis module described in the physical organ project version 2003. - automatic music player included to emulate keyboard.